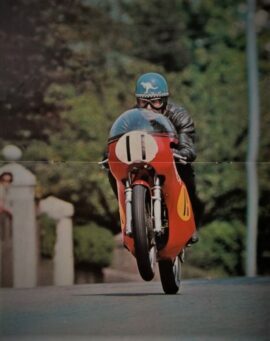 when he was the best motorcycle rider of all time, Giacomo Agostini. Let’s say that for his motorbikes he used mainly the engines of the Moto Guzzi, on this the one of the Le Mans, “laid down” on a frame made by him, with a (fantastic) look 60 years. 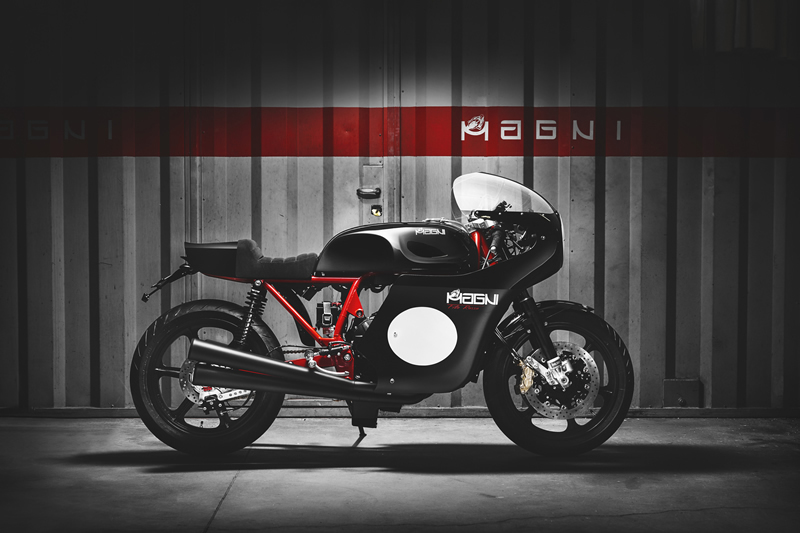 By the way this bike, like all the other Magni, literally makes the Japanese “go crazy”, and I do not know if I explain myself ……. 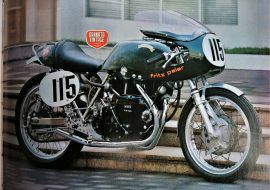 I am convinced that this bike was very important for Mr. Magni, given the name Arturo …… 1000. Built in a small factory, very crafted, where together with the founder there are also his two sons Giovanni and Carlo, with their three workers.  And to think that to push Arturo Magni to found his own brand was ……. 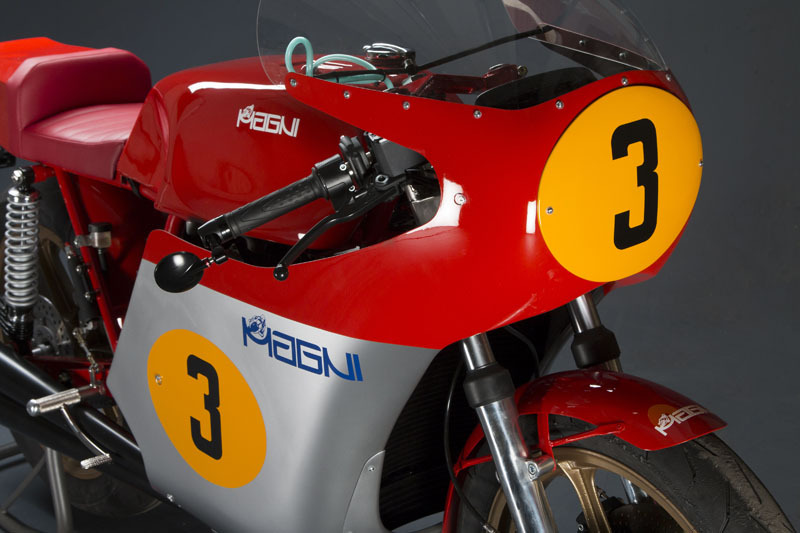 the withdrawal from the competitions of MV Agusta, he former director of the racing department, an intuitive talent scout (Agostini), with a palmares of 75 titles, including 37 brands and 38 drivers. I believe, therefore, that it would be difficult to stay away from the world that had consecrated it among the greatest of a certain period. 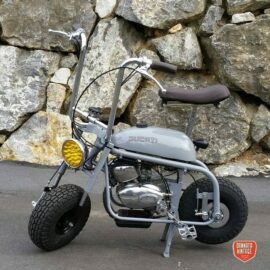 the same that over the years knew wisely to use the engines of major manufacturers (BMW, Honda, Moto Guzzi, MV Agusta, etc. ), without ever giving up, without ever losing any of the experience gained. The sons, Giovanni and Carlo, in 2014 presented at Eicma a new, aesthetically spectacular, motorized MV Agusta, the Filo Rosso. Proposed in two versions, the first red and gray, the second completely black, the reference to the motion of a few decades before is very clear, aesthetically beautiful, especially the Black Edition. his experience in the racing world, adding two brands with a lot of history and experience. The two brothers have also declared that parallel activity will continue, the one that has always distinguished the Moto Magni, the restoration of more or less dated models of MV Agusta motorcycles. 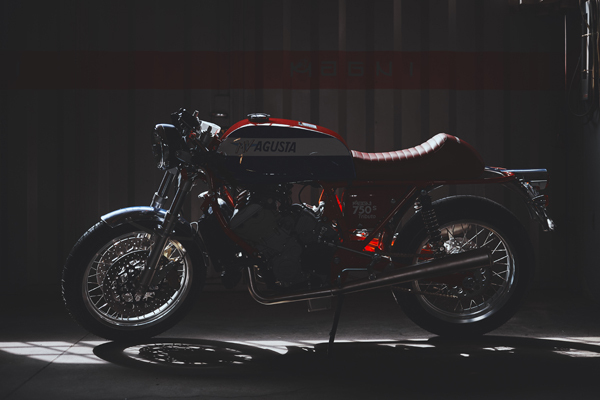 a motorcycle made by the Italian atelier “inspired by” the legendary MV Agusta 750 S, a motorcycle produced from 1971 to 1975, the same engine as the Brutale, but with a chassis designed and designed by Magni. With a production that I believe was struggling to exceed the 100 pieces a year, many of which are exported to Germany and Japan, countries where Moto Magni is a legend, all Italian. 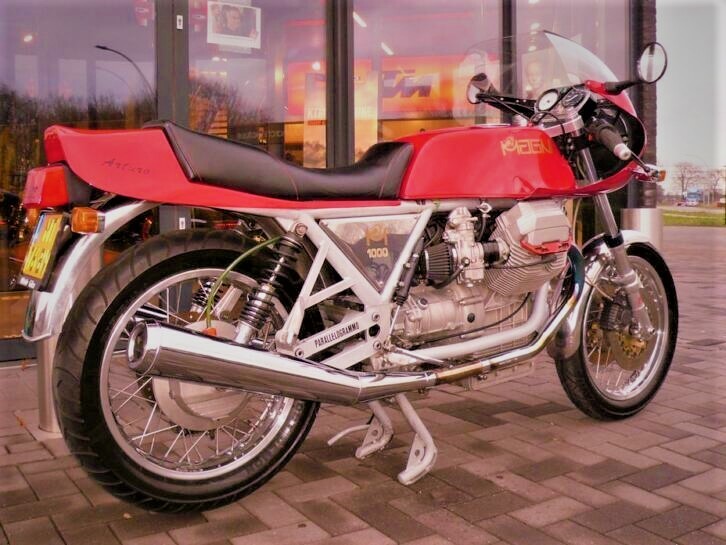 But let’s get to the Moto Magni Arturo 1000, otherwise my salivation;) ………..
we said that it fitted the engine supplied by Moto Guzzi, with an effective displacement of 948.8, without any modification, except for the new discharges produced by Lafranconi. A double cradle closed, with the two removable lower parts, to allow the extraction of the engine, with a weight of only 12 kilograms. Beautiful spoked rims, very vintage, able to not feel too much nostalgia for a motorcycle of the 70s. Also the front fork, teleidraulica, is produced by an Italian company, from Forcelle Italia, with pipes of 40 mm in diameter, and 140 mm of excursion. a swingarm with double parallelogram, in steel tubes, mounted on eight spherical plain bearings, expressly studied and modified for the Arturo. 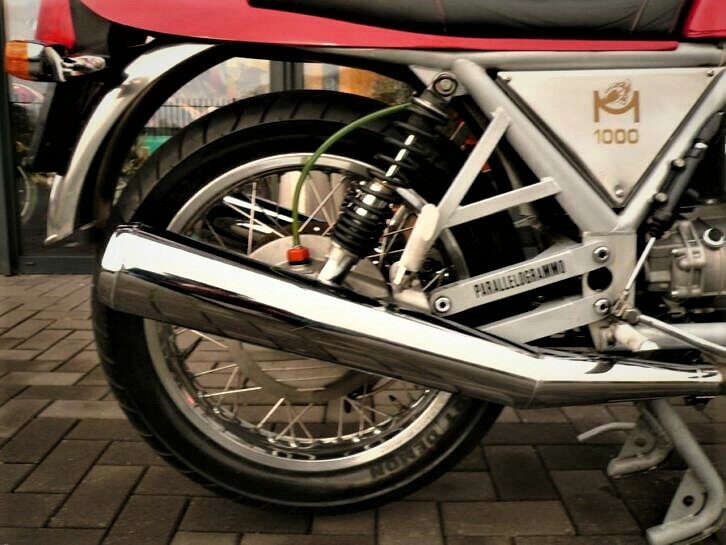 The Parallelogram is an innovative rear suspension system designed by the Magni company. 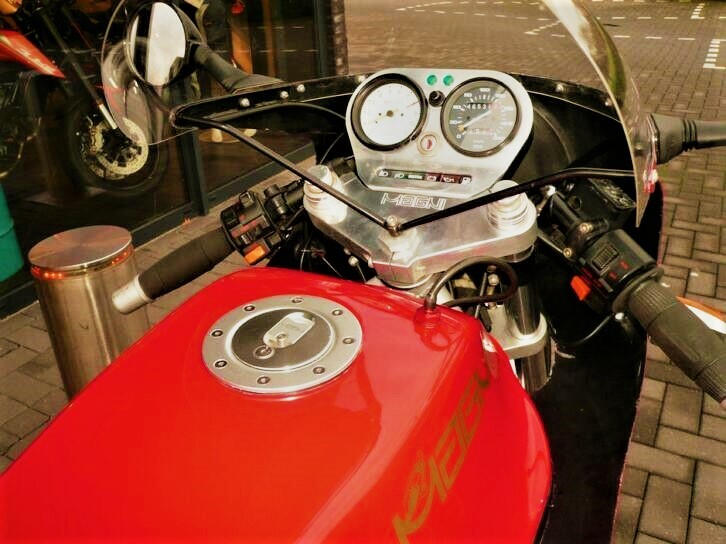 When riding a motorcycle equipped with this system you immediately notice the elimination of the reactions induced by the bevel gear during acceleration and deceleration: the saddle is no longer raised during acceleration of the vehicle and the lowering during deceleration. 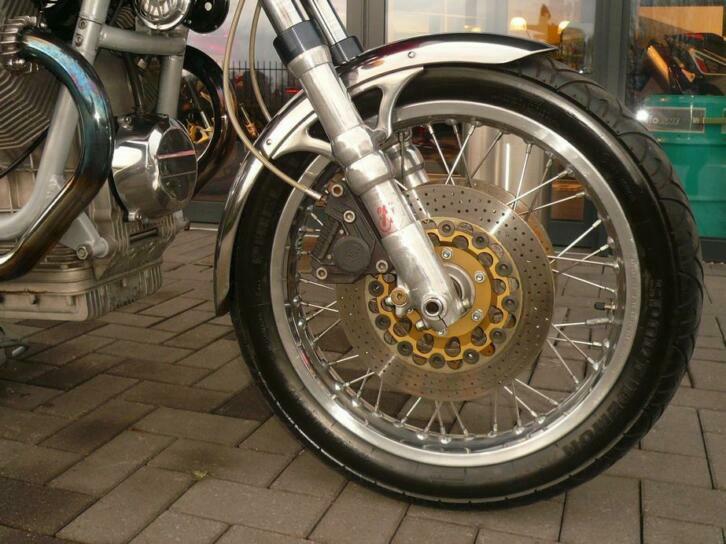 The motorcycling of the motorcycle becomes the same as that of a motorcycle with a final chain transmission. For the assembly of the kit it is not necessary to make changes to the original frame. 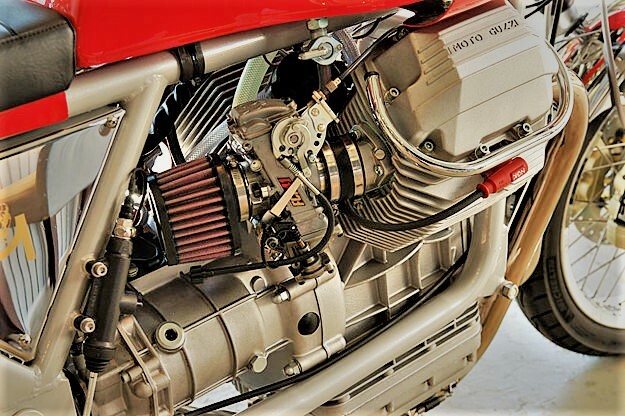 Along with that Magni patent, two shock absorbers that assist the swingarm…..
a cardan shaft transmission, to transmit the full power of the beautiful Moto Guzzi engine. Brembo braking system, two 280 mm front discs and a 260 mm rear disc. 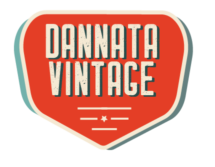 with a beautiful round headlight framed by a 70-year-old cafe racer dome, a tank with the Magni logo in evidence, a long saddle, chrome-plated fender ……. 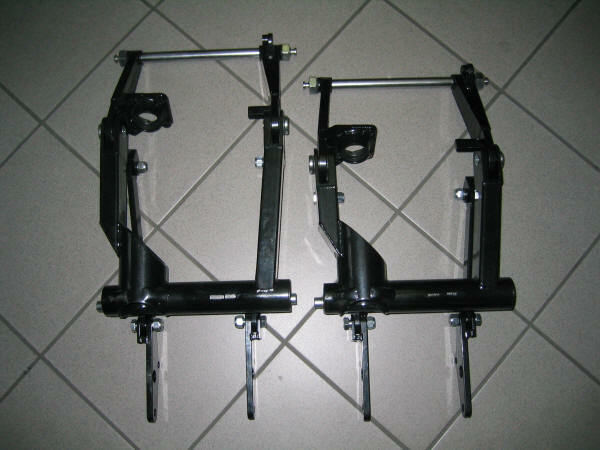 qualitatively all Italian, except for the rear shock absorbers produced by Koni. 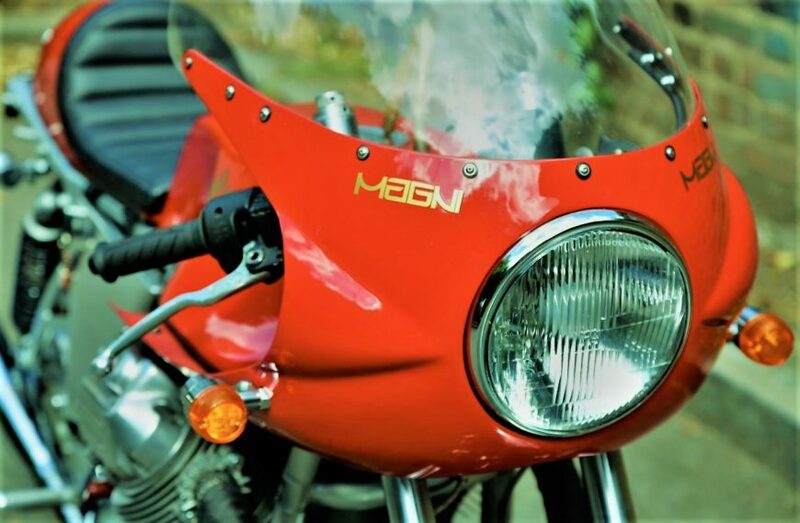 the Moto Magni Arturo 1000, a semi-fairing presented in 1987 ……..
make known and appreciate a person like Arturo magni, I wrote it out, almost on impulse, with so much enthusiasm while trying not to go too far. I sincerely believe that the Moto Magni is a brand considered among the most important, among the very first among those craft.